I had promised this recipe to you in the summer and I’ll admit that it got lost in the shuffle somehow. When I finally came across it again I was gutted that I forgot to share it when tomatoes were at their prime and in season! UGH! Which is a real shame because this pasta recipe is one of my favourites. That’s why I’m sharing it anyway! The tomatoes in this dish aren’t consumed raw, they get cooked out and blistered up. Almost like a rustic tomato sauce from scratch. Still totally perfect for these cooler temps. I love this recipe - it’s simple, rustic and bursting with flavour. If you’re grain-free, simply swap the pasta for zucchini, sweet potato or butternut squash noodles. This past year I’ve been using quinoa pasta because I find it sits better than some of the other varieties. 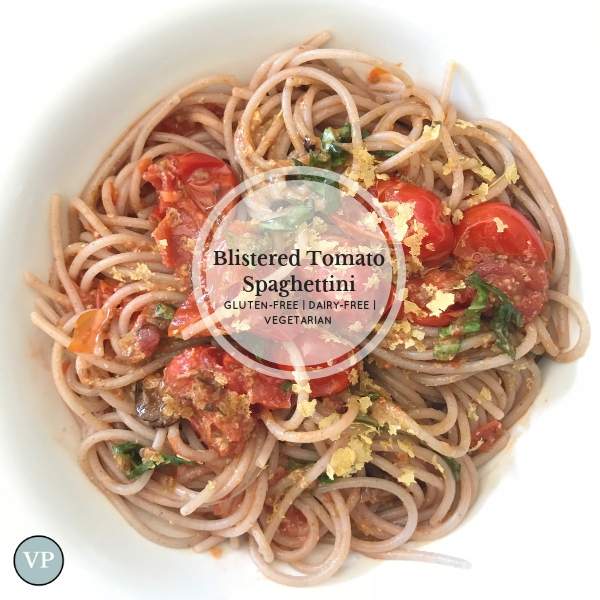 For awhile I was using bean/lentil pasta but it leaves me feeling heavy, fatigued and bloated afterwards. Clear signals that I’m not properly digesting it. I love the idea of using bean/lentil pasta for the awesome fibre content but digestively, it doesn’t always agree with me. It’s important to pay attention to these cues from your body. Some individuals, especially those already struggling with digestive issues can have difficulty digesting beans, legumes and even grains (including non-glutinous grains). Although we do try to eat predominantly grain-free (often we’ll do veggie noodles in place of pasta) sometimes you need the real deal! Coming from an all Italian family, pasta was something I grew up on - old habits die hard, right? It’s my version of fast food and also my comfort food. I seem to do just fine with quinoa pasta (as long as I don’t over do it in terms of portion size), so play around with different varieties and see which sits best with you. Eating pasta isn’t “bad”. In fact, in our home we eat pasta a few times a week and I have no problem including it on my client meal plans. The key is opting for a gluten-free or even grain-free noodle, loading up your pasta with veggies (extra fibre is crucial for blood sugar management), including really good quality fats like an extra virgin olive oil or ghee & going dairy-free or at the very least choosing organic or (if you can find it) raw cheese. Boil pasta according to package directions. For this specific brand, it’s 10 minutes for al dente. oregano and chilli flakes and sauté for about 1 minute until fragrant. Add grape tomatoes and allow each side to blister. About 8 minutes. As tomatoes soften, you can use a fork to press down and release their juices. Add nutritional yeast, sea salt and black pepper to pan and sauté for a couple minutes longer. Take 1/2 the blistered tomato mixture and pulse in a food processor until smooth. Remember to reserve 1/4 cup of pasta water. You may need it. Add pasta to a serving bowl, generously spoon the processed tomato sauce over top and stir. If pasta seems too dry, add a little of the reserved pasta water as needed. Spoon the blistered tomatoes over top, extra nutritional yeast if desired and fresh basil. Taste carefully for sea salt and pepper and adjust accordingly. I want to know! Are you a pasta lover too?